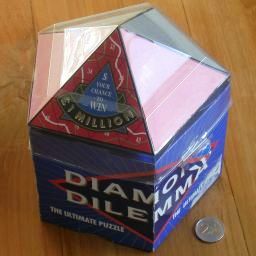 The Diamond Dilemma consists of a large number of small triangular magnetic tiles, and a metallic board onto which the tiles should be placed. The board is a polyhedron with 10 faces which are regular triangles, like two five-sided pyramids stuck together. Each face can hold 16 of the magnetic tiles. The tiles have one or more lines on them, each connecting two of the sides, and they are supposed to be placed so that the lines join up exactly to form one long closed loop. Use the 32 silver-grey tiles to cover two faces such that the white lines form a continuous loop. Use the 48 red tiles to cover three faces such that the white lines form a continuous loop. Use the 80 blue tiles to cover the five faces of a pyramid such that the white lines form a continuous loop. Use all 160 of the red, white, and blue tiles to cover all ten faces of the board such that the gold lines form a continuous loop. There was a prize of a quarter of a million British pounds to be shared amongst those able to solve the gold challenge, with a further million pounds going to those who also got a bonus question correct. About 32000 puzzles had been sold by the time of the competition deadline in 1990, but these prizes were left unclaimed as no one had solved it. For the Blue challenge the prize was a new Jaguar car, and it was won by one of the 750 or so people who had solved it before the deadline. There were two prize draws for the red challenge and ten prize draws for the silver challenge. The tiles are shown below, although I have used straight lines instead of the curvy ones on the original tiles. Along each tile edge there are 11 equally spaced points at which a line can start or end. As the tiles are rather small, it is very easy to make a mistake. I have run a computer search to find all solutions. It found two solutions to the silver challenge. The first solution has a regular pattern in the tile orientations, so is likely to be the solution that the designers intended. There is only one solution to the red challenge. There is only one solution to the Blue challenge. I have not yet found a solution to the Gold challenge. It is not known how many solutions there are.